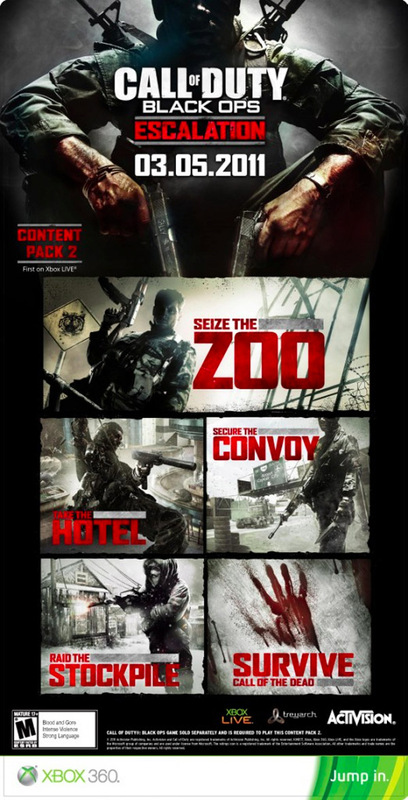 The flyer displays four new maps, Zoo, Hotel, Convoy, and Stockpile, plus a new zombie mission Survive. This follows the same pattern as the First Strike map pack, which released in February for Xbox 360, and March for PlayStation 3 and PC. While Escalation has not yet officially been announced, it is assumed it will follow Activision’s traditional pricing model of 1200 Microsoft points, or $14.99 for PlayStation 3 and PC.